The Alliance for the Great Lakes boasts the largest volunteer beach clean up program in the region: Adopt-a-Beach. School groups, colleges, community organizations, faith groups, businesses small and large, families, and individual Great Lakes enthusiasts make up the 15,000-plus volunteers who participate in the program every year. Getting 15,000 people out to local beaches to remove 40,000 lbs of litter is no small feat. The credit for that massive turnout goes to those who make up the backbone of Adopt-a-Beach: team leaders. What’s the role of an Adopt-a-Beach team leader? When you visit the Adopt-a-Beach website you see red pins spanning across the region. Each pin is an upcoming Adopt-a-Beach cleanup organized by — you guessed it — a team leader! An person who loves to keep their local corner of the Great Lakes clean and healthy with their community members. 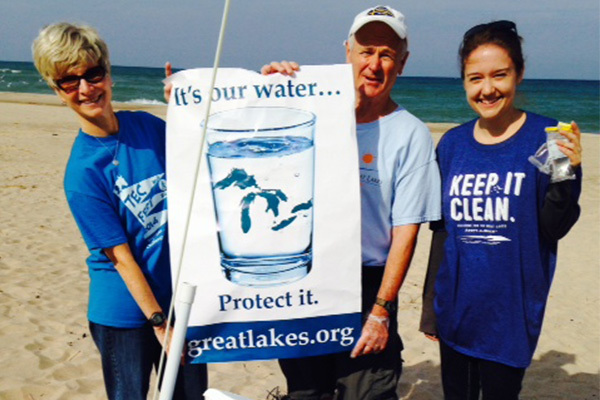 Every year, Adopt-a-Beach team leaders lead volunteers in cleanups across all five Great Lakes. And that takes a lot of behind-the-scenes work: selecting a beach, scheduling an event, inviting friends, family, and coworkers to register, getting trained, leading volunteers through safety and litter monitoring procedures, compiling volunteer and litter information, and sending that information into the Alliance. Whew! But, don’t worry! We interviewed a few team leaders and they assured that not only is the work worth it, but it’s a lot of fun. Hideko Toyokawa leads the Japanese Chamber of Commerce team in Chicago, Illinois. As an organization, they have been cleaning beaches with Adopt-a-Beach for 23 years, and Hideko has been leading the clean-ups for three. When asked her favorite part of being a team leader, Hideko said that she loves her volunteers’ enthusiasm. “We never have to try very hard to recruit people to our cleanup. People jump at the opportunity to give back to the community and give back to the lakes,” she said. The enthusiasm of her volunteers is ceaseless, and contagious. “People always return every year. I enjoy how eager everyone is to do a good thing.” You can find Hideko and her cleanup crew on 57th Street Beach in Chicago every year. Hideko Toyokawa’s Adopt-a-Beach team, the Japanese Chamber of Commerce in Chicago. Across Lake Michigan, you’ll find team leader Cory Robinett. Cory started as an Adopt-a-Beach volunteer 20 years ago, and has been a team leader for 18 years. Every year during September Adopt-a-Beach Cory and his friends and family head to Hoffmaster State Park in Michigan for a weekend of camping and cleaning the beach. Cory was cleaning beaches before he was a father, and says that his kids are now a big inspiration for his work as an Adopt-a-Beach team leader. “It’s important to be a good role model for them. My kids see me being a leader, and that will inspire them to help out and protect the environment,” he said. Cory Robinett and his Adopt-a-Beach team cleaning up Hoffmaster State Park, MI. Patrick Rodriguez had similar thoughts on team leadership. Patrick has been leading his team at Jeorse Park Beach in Indiana for eight years, and has removed more than 1,000 pounds of litter from the beach over the years. Patrick pointed out,“if we don’t take responsibility for our environment, we’re going to hand over a polluted world to the next generation.” Patrick spent his summers on Jeorse Park Beach as a kid, and wants to see that the beach continues to be healthy for years to come. He is dedicated to getting his community involved in the cleanups, so much so that even the mayor attends! Kim Kettner and her co-leader Wendy Lutzke host a number of cleanups every summer in their community through their organization, Friends of the Manitowoc River Watershed in Wisconsin. To people considering becoming a team leader, Kim said “it’s very rewarding to facilitate families and young children in cleaning up the beach. They say they’re helping save the world, and you get to be a part of that feeling.” Kim said it’s also fun to see the different kinds of people who want to get involved — she’s led all sorts of volunteers, from a Tae Kwon Do team to sisters from a local convent. It’s always fun to see who turns up to volunteer! The Alliance is grateful for all the hard work by team leaders and volunteers alike. Everyone who participates in Adopt-a-Beach is making a difference at their local beaches and in the Great Lakes region as a whole. 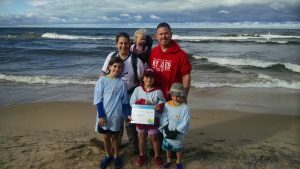 Team leaders make the Adopt-a-Beach program happen every year, and the Alliance is always looking for more Great Lakes enthusiasts to keep our beaches healthy and clean. If you’re interested in leading a cleanup on your local beach, get in touch with an Adopt-a-Beach field staff member. See you on the beach! Adopt-a-Beach team leaders are provided training and given cleanup materials thanks to the generosity of our donors. Donate today to keep their hard work and leadership going in 2018!